The 1998 Toyota Corolla was a major advance over past models, with a new engine that provided good power with excellent economy, a very comfortable interior, and Toyota's usual reliability. The current generation is, as was the one before it, evolutionary, and focused on bringing the Corolla up to date with current safety and gadget standards, without raising costs too much. That means satellite radio, dual variable valve timing, voice control, and cellphone connectivity are all included, but in some ways the 2009 Corolla does not feel as upscale as in prior years. 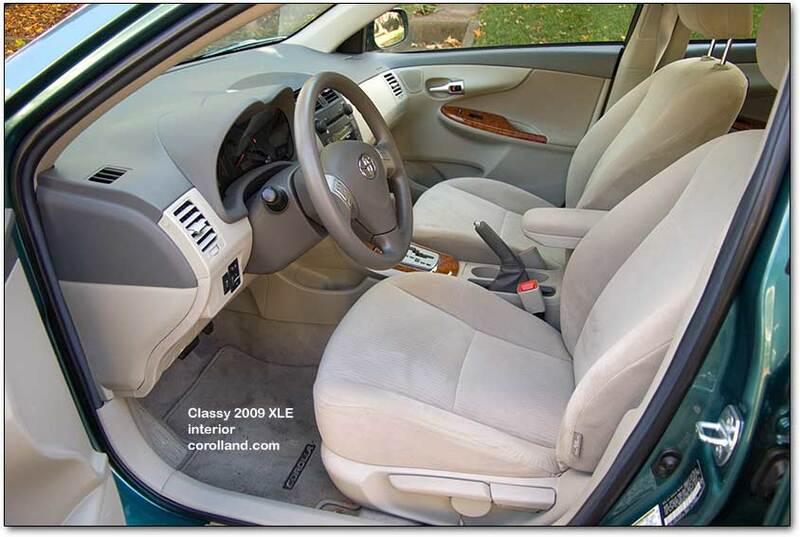 Interior space is similar to the prior generation, with nearly identical headroom, legroom, and shoulder room; more glass and lighter interior colors made the 2009 Corolla seem larger inside, while changes to the instrument panel made the Corolla look more refined. 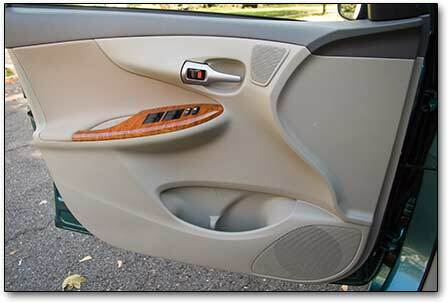 The interior of our XLE model was nicely executed, looking considerably more upscal than most small cars; woodgrain-style trim panels on the doors and the lower center console added to the appearance, while curves and contours on the light beige plastic panels (augmented by cloth on our XLE’s doors) avoid having massive expanses of cheap-looking plastic. Upper panels are a nonreflecting gray, aiding visibility in direct sunlight and providing contrast. In short, the look is classy all around. A new base engine on the Corolla has nearly identical power figures to the prior engine, but it is lighter, which can improve cornering and mileage; it also adds noise and does not sound as quiet or as refined. 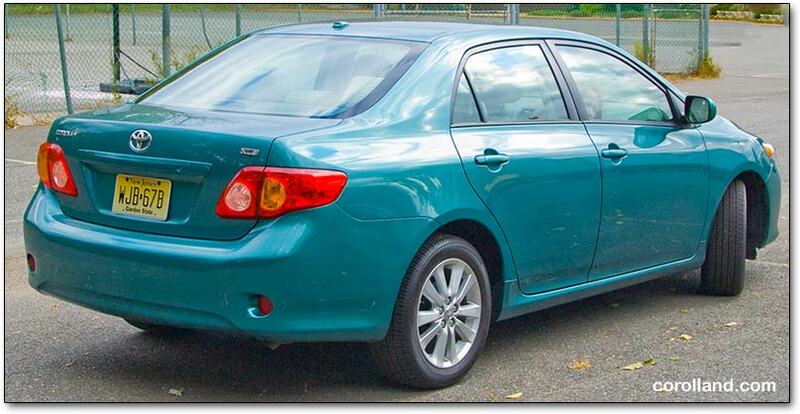 Given that gas mileage (according to 2008 EPA measurements) is still respectable on this safer, heavier Corolla, at 27 city and 35 highway with an automatic (or with a manual), we suspect the engine may be more efficient than the prior, reliable, quiet powerplant. The 2004-2008 model engine was eager and willing, though it ran out of power on sustained sprints, and felt better under part throttle. The 2009 seems to be the opposite: it often seemed to run out of power unless we floored the accelerator and got a good downshift. Once revved past 3,000 rpm, the engine was powerful and the Corolla sprinted forward. Acceleration was more than fast enough on highway-ramp sprints; it was the odd city zoom that brought problems (and part-throttle acceleration once at speed on the highway). Flooring the throttle to get a downshift brought a rapid and satisfying response; manual transmission buyers may find themselves downshifting more to avoid the problem. In the hands of an attentive stick-shift driver, the Corolla should be a quick little car. The gearshift allowed for selection of third, second, and first gears. The transmission generally shifted very smoothly and tended to be in the right gear at the right time, though as mentioned it seemed reluctant to downshift; it appeared to be programmed mainly for fuel economy, and the Corolla coasted more readily than most cars. At times, while coasting in high gear, there was a moderately jarring transition to what seemed like freewheeling; at other times, the transmission refused to kick down under full throttle, leaving the engine out of its power band for agonizing seconds. On the whole it shifted smoothly but we’re looking forward to further tuning as time goes on. Cornering on the XLE seems better than on the 2004 model we tested, while the comfortable, well-cushioned ride and quiet interior were preserved. Most drivers will find that the Corolla does everything they ask for it, and those who want more will find a simple change of tires will go a long way towards filling their needs. The Corolla is even more nimble than prior generations, and though the tires still protest under stress, they do so with much less provocation. Those who want better cornering and more power, and who are willing to give up the comfortable ride to get them, may be happier with the Corolla XRS. The electric power steering might annoy some drivers; it seems to have a less natural feel than hydraulic power steering, with an annoying tendency to seem to want to stay in whatever position it is currently in and a too-even feel when turning. The electric power steering needs a lot of tuning before it will feel natural, but we can probably expect incremental improvements through the 2009 model year. The turning radius is nice and tight for easy maneuverability. 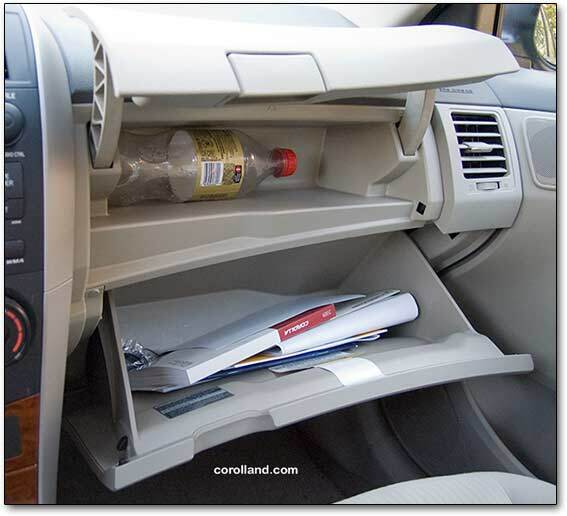 Toyota’s usual proliferation of clever storage spaces has been continued, with the usual small compartment on the left side of the dashboard, map pockets on all four doors, a covered center compartment that looks like an ashtray, a small two-level covered console between the front seats under a sliding armrest, an overhead sunglass holder, and not one but two glove compartments. The top compartment isn't very large, but the door moves completely out of the way; the lower one is big enough for all the manuals and papers and quite a bit more. Finally, two cupholders included a sizer to hold smaller mugs or cups. The gauge cluster — a huge speedometer (going up to an absurd 150 mph) and tachometer are flanked by small temperature and gas gauges — has white backlighting, red pointers, and amber metric numbers. There are two small digital readouts, backlit in amber; one shows the odometer (or trip odometer) and gear, while the other shows the trip computer readouts. By pressing a button awkwardly placed on the instrument panel, you can cycle through instant and average gas mileage, distance to empty, elapsed time, temperature, average speed, and the time. The main switches and knobs have a solid feel, and are large enough to be operated by people with gloves. A separate stalk contains the cruise control on cars that have it (ours did not), with up adding speed, down reducing it, and a pull cancelling the control for the moment. An on/off switch on the end of the stalk shuts it off entirely. We have found this to be the ideal setup. The interior was well insulated against outside noises. There was little tire or wind noise, and the engine was refreshingly quiet. Our test vehicle, which included a thousand-dollar stereo option, had audio controls on the wheel, covering volume and preset up/down. It also had a voice control feature for cell-phones which behaved similarly to the GM system. Headroom is surprisingly good, the seats are moderately comfortable (though not as much as the Cobalt). The legroom is more than adequate unless you have unusually tall people in front and back on the same side; indeed, the Corolla is now the size of the Camry of years past, and many of those looking at Accords and Camrys should probably look at the Corolla instead. The cloth seats in our XLE looked classy and neat, and held the driver in place. Inside the cabin, lighting was unusually bright and covered the entire vehicle. The trunk was spacious, and the rear seats folded down when needed; the hinges intruded into the trunk, but that probably will not be a problem. 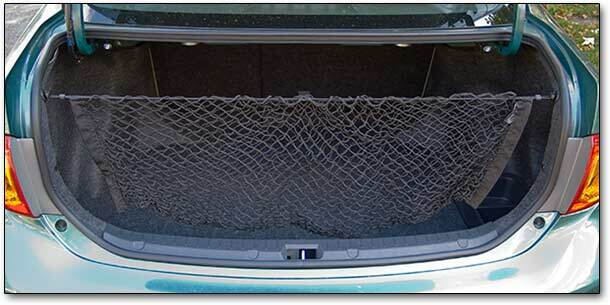 Our test car came with a handy cargo net, fastened with a hook-over-post system that was easy to engage and disengage; the trunk also had some shallow compartments to keep smaller items from sliding around on every turn. The engine bay was neatly arranged; it looks as though mechanics will find most underhood jobs relatively easy, at least in terms of accessibility. Some empty space surrounded the 1.8 liter engine, no doubt required for the bigger Camry four-cylinder. Visibility was generally very good, with lots of glass; the fashionable larger rear pillar got in the way, though. Headlights were bright and well focused, but they were also on all the time, due to the daytime running lights; a warning light appeared when the headlights were used, night or day. The sun visors were relatively skimpy and did not extend, allowing blinding sunlight to get through without any possibility of blocking it. The sunroof was large and nicely far forward so the driver and passenger could enjoy it, and interior lights in front and back lit up the interior nicely. The car had automatically dimming lights, but as soon as the key was removed, the stereo went out (no power memory). While a low-end Corolla starts at around $16,000 — enjoying a hefty premium over the Chevrolet Cobalt and other small cars — those who sell their cars after a few years generally find that Corollas cost less than “cheaper” vehicles due to better resale values. 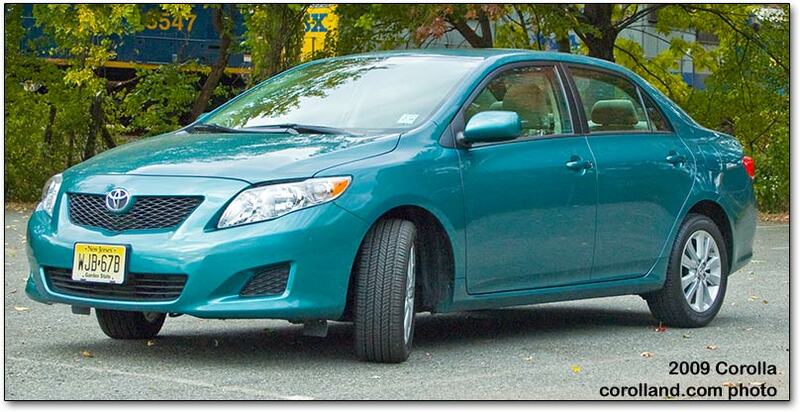 Our XLE, being a high end Corolla, started at $18,210 including destination charges. That includes a four-speed automatic, front side airbags and front and rear curtain airbags, four wheel antilock brakes, tire pressure monitoring, folding outside power mirrors, variable wipers, filtered air conditioning, six-speaker satellite stereo with auxiliary port, power windows and locks, trip computer, and tilt/telescoping steering wheel. Our test car ran to $20,970, which is Camry turf, though the Corolla’s better mileage recommends it over that staple of American life. To get into that territory, our test car had a JBL stereo with CD changer, eight speakers, vocal control, and steering wheel controls - at a whopping $1,060. It also had more expensive alloy wheels ($410), a weather guard package ($150), moonroof ($890), and stability / traction control ($250). The pricing of the options seemed almost random to us, but there you have it. Like most competitors, the Corolla comes with disc front brakes and drum rears. Front brakes are vented to prevent brake fade. While the Corolla engineers have worked on interior space and staying up to date, other automakers have been making strides, and the Corolla is no longer as far ahead of the pack as it was in, say, 1998, when it was clearly the leader in comfortable small cars. While resale value and quality (judging from the 2008 models) both remain top of the pack, buyers should take a look at some other, undervalued cars that may be a better value for those who keep their vehicles a long time (or buy them used). That said, the Corolla’s gas mileage is especially impressive when you compare the automatic transmission versions of its competitors to the ’rolla automatic: as in the past, there is no apparent gas-mileage penalty to going with the slushbox. The Toyota Corolla remains a strong choice, with a long record of quality and high resale values, highly competitive gas mileage, and a parent corporation that has been responsible to its employees, its customers, and the environment. It remains hard to go wrong with the Corolla. Also see our Corolla XRS car review — the XRS shoves a Camry engine under the hood for a lot more go-power.